While it is now technically Spring, there really aren’t too many signs of it yet. 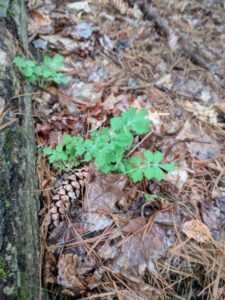 There aren’t any signs of amphibians, but there are some small green plants starting to come up through the ground, which is a welcome sign. 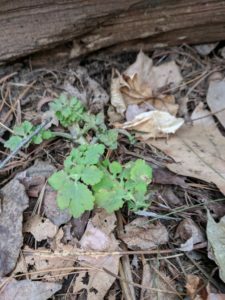 There’s a chance that some of these plants could be wildflowers that have yet to bloom. 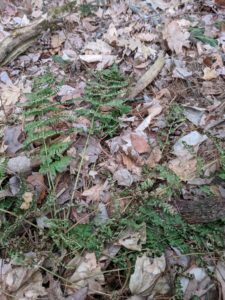 The ferns are also starting to come back to life, which is a welcome sign. 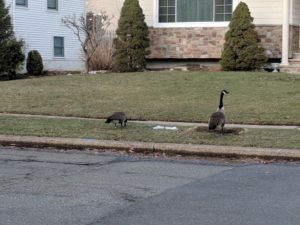 One of the biggest signs that Spring is here is that the birds are back! On my walk to my spot, I saw a robin, a black-capped chickadee, and a small woodpecker. I now also understand what mud season in Vermont is, because after only five minutes of walking into the woods, my boots were covered in mud. 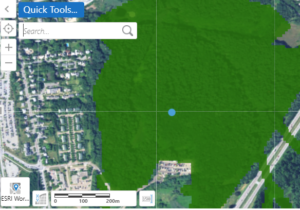 From a landscape ecology perspective, Centennial Woods does not have interior forest. 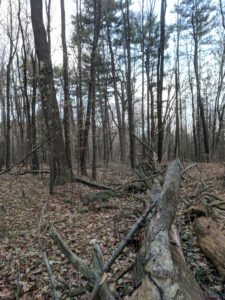 While my site is at least a ten-minute walk into the woods, I can still hear the highway not only during my entire walk, but also from my site. 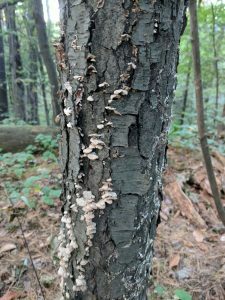 There is also evidence of edge effects going on because as compared to the interior forests that I’ve been in, there is a relatively low amount of biodiversity in Centennial Woods. There’s also a lot of sunlight shining into the woods and relatively heavy erosion. By my best estimate, the nearest edge to my phenology spot is a little under 100 yards away. It’s been a while since I’ve last been here, and so much has changed. One of the most significant changes is the groundcover; there’s snow! Granted, there isn’t more than an inch and it’s only off to the side of the trail because the trail, due to heavy usage, is pretty much a sheet of ice. It was a struggle to get to my spot, and if I hadn’t worn my microspikes in, I’m not sure if I would’ve made it. The second major change is that now, all the leaves are off the trees. 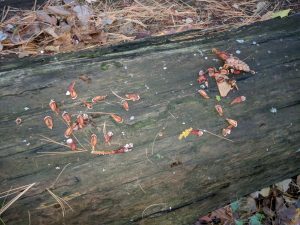 There are still some beech trees with a few leaves on it, but that’s not abnormal, and other than that, all the other trees have dropped their leaves. This is a change that I think probably should’ve come last semester, but the unseasonable warmth prevented that from happening. In terms of wildlife activity, there isn’t much. I heard a bird, but it was only one, and I’m not entirely sure what it was. 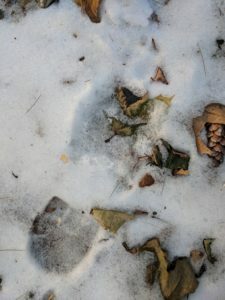 It was difficult to find wild animal tracks, but once I ventured a little bit off the beaten path, I managed to find a relatively well-formed deer track. 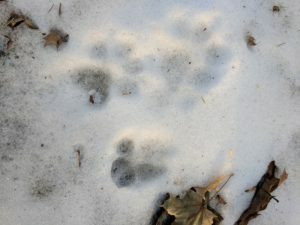 While there weren’t many signs of wildlife activity, there were plenty of dog and human tracks, which is probably one of the reasons there isn’t much wildlife. 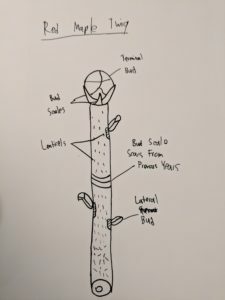 When it came to tree identifications, it’s definitely a lot harder in the winter. 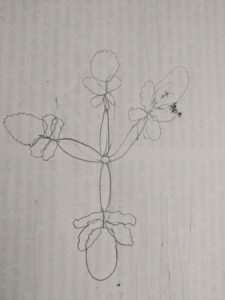 I had some difficulty even trying to find the twigs on the trees, but even when I did find them, it was still hard to get positive identifications. 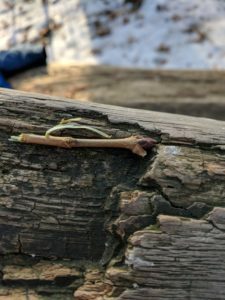 Also, I tried to take some nice close-up pictures of the twigs that I did find, but my phone camera isn’t the best at close-ups, so they might be a bit blurry. 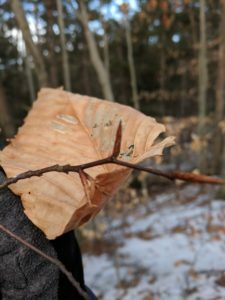 The trees I was able to positively identify by twig are Red Maple and American Beech. Although it’s not officially winter yet, Centennial Woods is definitely looking very wintery. When I was last here, there were a good amount of leaves off the trees, but now, almost all of the trees have dropped all of their leaves. 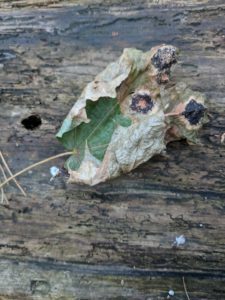 The Only exceptions to this are some of the diseased maple trees I observed earlier and the beeches. While these trees haven’t dropped their leaves, the leaves remaining on the tree are very dead. 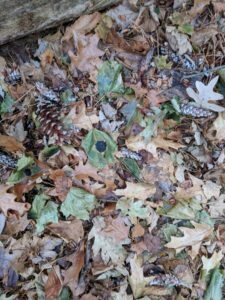 With all these leaves falling, the composition of the forest floor has changed and now instead of being primarily covered in pine needles, there is a thick layer of leaf litter. 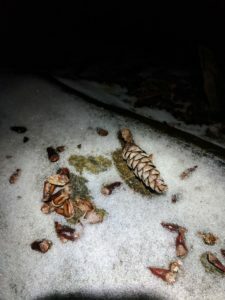 There’s also a lot of pinecones on the ground. Since it’s getting colder out, I didn’t see very many animals. There were some birds flying in a flock overhead (maybe migrating) but I didn’t see the squirrels and chipmunks that I’m accustomed to seeing. While many phenological signs indicate that it’s winter, there still isn’t any snow. 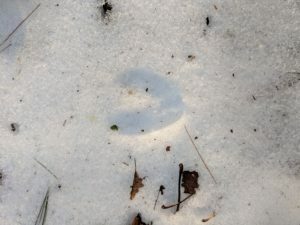 Burlington got some snow last week, but it has been pretty warm past week, so any snow that accumulated has since melted. Having no snow sure makes it a lot easier for me to get to my site, but in the past, this would’ve been a problem. This is because Centennial Woods used to be home to a ski hill. The hill, officially named the South Burington Kiwanis ski area, was opened in 1962 and operated for five years before the rope tow and associated machinery were accidentally burned down by children who were playing with fire. 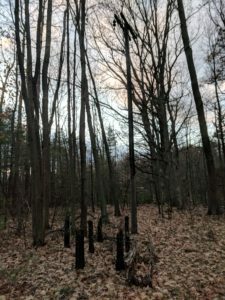 At first, I wasn’t sure of the accuracy of this story, but I saw some information online that gear of the rope tow, one of the lift line towers, and some supports, can still be seen in the area. So I hiked in a little deeper than usual and after a whole lot of up and downhill, I arrived and found the remnants of the ski area. 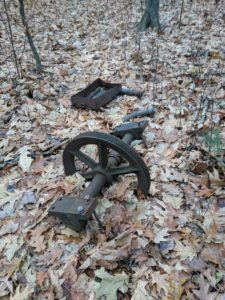 The gear was rusted and the supports were charred, but it was very clearly a ski area, although the part of the forest that contained the ski trail has since grown back. There used to be many of these small, local ski areas in Vermont, but due to current trend in towards large resort areas, many of these areas closed. It’s incredible to think that less than fifty years ago, there was a ski area on the University of Vermont campus. “South Burlington Kiwanis Ski Area.” New England Lost Ski Areas Project, www.nelsap.org/vt/sburl.html. 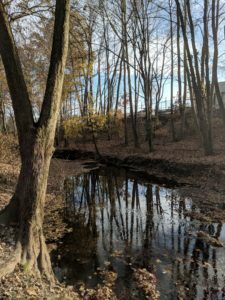 As I walk along Van Saun Mill Brook on a trail many feet wide, I see many stories playing out in front of my eyes. The first, and most visible, is that of a refuge, designed to provide the residents of suburbia with a place to get away from life. 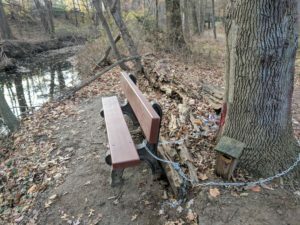 Between the oaks, sycamores, poplars, and maples are benches, birdhouses, and many other items placed by humans in an attempt to make the area more welcoming to both human and non-human visitors. The second story is one of a place struggling to hold on to the little bit of wildness it has left. Across the brook, you can see the backs of stores, hear the highway, and smell the curry made by the nearby Indian restaurant. 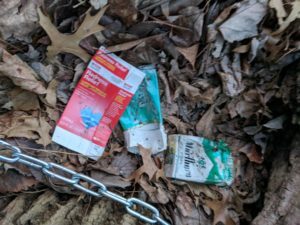 Nestled in the scrubby vegetation along the banks are bottles, cans, and other litter. The trees are covered in graffiti. 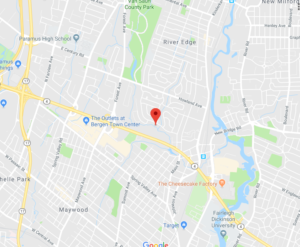 Clearly, this area is used not only by those looking to get away from suburbia, but also by those who see the woods as an extension of suburbia. While these groups may seem different, they both want freedom, with the first group looking for a place to be free from everyday suburban life and the second group looking for a place where they can freely drink and do drugs without facing any of the social stigmas or legal implications that are often associated with this sort of activity. 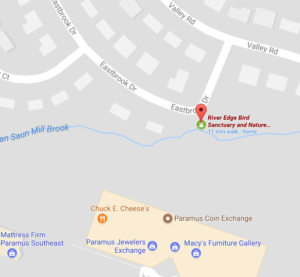 Immediately after stepping foot on the Mill Brook Nature Trail, there are many visible physical differences between it and Centennial Woods. 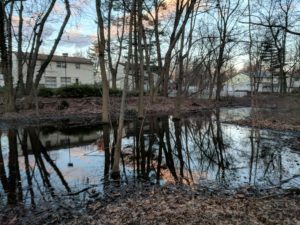 For example, my spot in Centennial Woods is on top of a hill, but the Mill Brook Nature Trail is very low lying, with very damp soil. 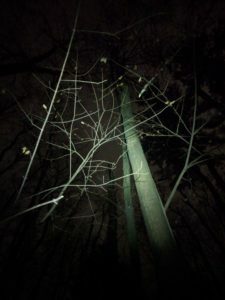 The composition of the forest is also very different. 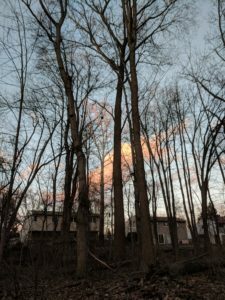 In Centennial Woods, the trees are primarily White Birches and Red and Sugar Maples, with some Eastern White Pines towering over all the other trees. Other than these trees, there are some ferns, but not a whole lot of ground cover. 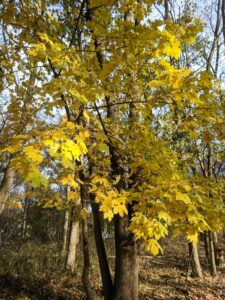 On the other hand, the Mill Brook Nature Trail is mostly Pin Oaks and Silver Maples, with a few other trees that do well in damp environments, such as Tulip Poplars and American Sycamores. There are also a lot of small scrubby bushes that cover a lot of the ground not occupied by trees, especially along the banks of the river. There are also a lot of Poison Ivy vines on the trees. The two locations are also at very different points phenologically. 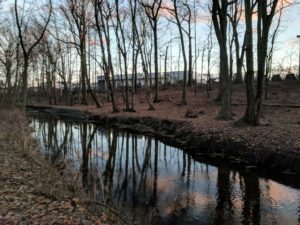 In Centennial Woods, most of the trees have lost their leaves but on the Mill Brook Nature Trail, most of the leaves are still on the trees. A reason for this could be the weather in each area. In Vermont, there have been quite a few overnight freezes, but in River Edge, NJ, which is almost 300 miles south of Burlington, has not experienced as low temperatures. Some big changes since my last visit. Fall is here for real now, with the temperatures dropping rapidly and the sun setting very early. 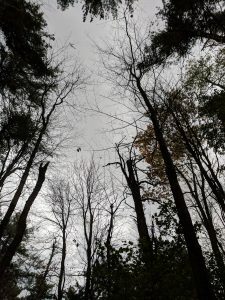 Fall is also visible on the trees, as almost all of them have dropped their leaves; the trees that haven’t dropped their leaves yet no longer have green leaves. Another major change is that as a result of the high winds the area experienced last week, there are a lot of downed branches. Something I found interesting is that all of the ferns in the area are still green. Ferns change color and die pretty quickly after the first frost, and although it’s pretty late in the season, I guess the first frost hasn’t happened yet. 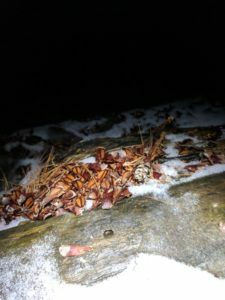 There is a lot more animal activity though, as the squirrels, chipmunks, and other animals are stockpiling food for the winter. It’s only been two and a half weeks since I last visited, but there’s been so much change. The trees are starting to change color, with the canopy now being a mix of yellow and green, as opposed to the solidly green canopy during my last visit. I noticed that while some of the trees directly off the trail have some yellow leaves, the ones off the trail are almost completely yellow, and I’m curious as to why that is. On some maples, the leaves have changed colors, but not to yellow. 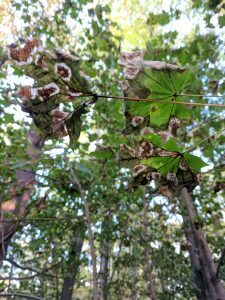 I’m not sure if I didn’t notice it last time or if this is a new phenomenon, but many of the maple leaves have black spots on them, which seems to indicate tar spot disease. It’ll be interesting to see if this gets better or worse as time passes. The eastern white pines, despite being evergreens, are also much different than last time. 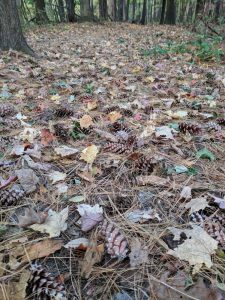 Although they’re very high up, making it difficult to assess foliage levels, the ground is now covered in pine needles and pine cones, which seems to indicate that the pines are dropping their needles. Unfortunately, I didn’t see much wildlife during this visit as there was a lot of human activity. I saw a few joggers, a dog walker, and a class that was doing fieldwork; all this activity kept the wildlife away. However, after everyone left, I began to hear birds chirping, insects buzzing, and even saw a few squirrels and chipmunks. The wildlife may not be very active when there’s a lot of people present, but it’s definitely there. 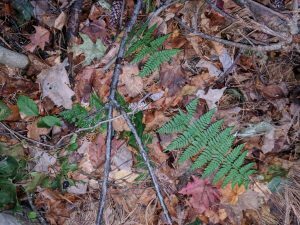 Welcome to my phenology blog! 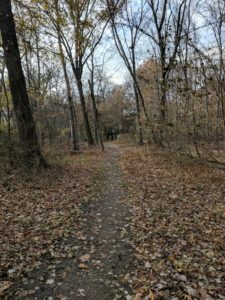 I chose Centennial Woods as my location for the semester mostly because it’s really easy to access, but also because it has a lot of variety. 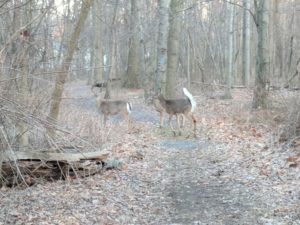 I know there’s a lot of human activity in Centennial Woods, so I made sure to pick a site that was relatively far from the entrance. 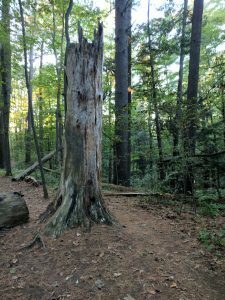 To get to my specific location within Centennial Woods, take Carrigan/Catamount Drive east until you see the trailhead for Centennial Woods. 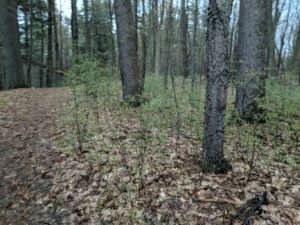 Once you get there, take the main trail until you get to a large clearing where multiple trails diverge. 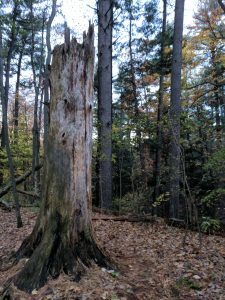 Take the one that goes straight uphill and continue on that trail until you come to an area that’s blanketed with pine needles and has a large dead tree stump in the middle. Take a seat on the downed log right next to the stump and you’re there. The area is dominated by maples, with Sugar, Red, and Norway maples making up the majority of the woody plants. There are also a few small American Beeches and even fewer Black Cherries. 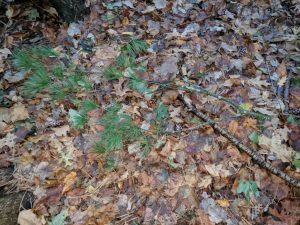 The pine needles on the ground are from very tall Eastern White Pines, which are difficult to see now due to the leaves on the deciduous trees, but should be easier to see when the deciduous trees lose their leaves.